When it comes to chicken, I've always grilled, fried or roasted it. Braising was something I hadn't done that often. With bone-in thighs on sale recently, I decided that it was time to get my braise-on and throw together a platter of Southwestern-style chicken. The main reason I don't opt for cooking chicken in braises or steam, is the skin. I love it crispy! There is so much flavor there. I've been guilty of picking the skin off entire pieces of chicken and leaving what's rest for someone else to finish. A habit that would give me a great shot at employee of the month if I worked at Kentucky Fried Chicken! What I found after preparing this dish was searing the chicken in a hot pan to start with was the secret. The brown crust provided texture on the skin and the fond on the bottom of the pan added yummy-goodness to the tomato-poblano sauce the chicken was braised in. The braising liquid featured poblano pepper, tomatoes and cumin. 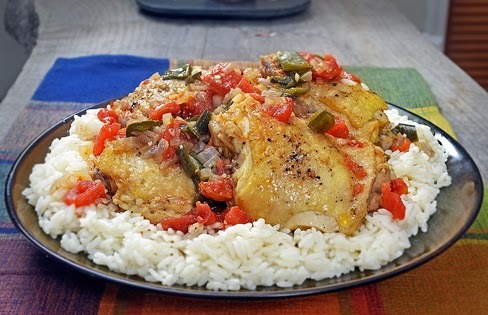 This complimented the chicken, gave the rice plenty of flavor to absorb and was the real binder to the recipe's overall flavor. I haven't been posting as much since I moved last fall, but I have been cooking more than any other time in my life. Now that I'm starting to settle into my new location, I'm finding more time not only to cook but also prepare posts. In an effort to share more, I'm going to be doing a lot more posts that feature just a nice artsy picture or two of the dish. I'm still going to be doing my signature-style recipe graphics, but I want to share more of what I'm doing in the kitchen and I can do a post like this in less than an hour, a recipe graphic takes between 6 and 10! Season chicken with salt and pepper to taste. Heat a little oil in a large skillet over medium high heat, brown chicken on both sides. 4 to 6 minutes per side. Remove to paper-towel lined plate. In hot drippings, saute onion and poblano pepper until soft, 3 to 4 minutes. Salt and pepper to taste. Add cumin, oregano, red pepper flakes and garlic. Stir and cook until fragrant. 1 to 2 minutes. Add tomatoes and chicken broth, scrape browned bits from bottom of pan and bring to a simmer. Make a bed of rice on a large platter, spoon half of sauce on rice. Arrange chicken thighs on top. Spoon other half of sauce onto chicken, then serve.